2019 is well underway – the hairs are getting greyer, Fortnite continues to extract every last penny of my kids’ pocket money, and the utilities industry here in the UK appears to be thriving. Now, I can explain the first of these. The second baffles me, and the third is testimony and credit to the people driving change within the industry. 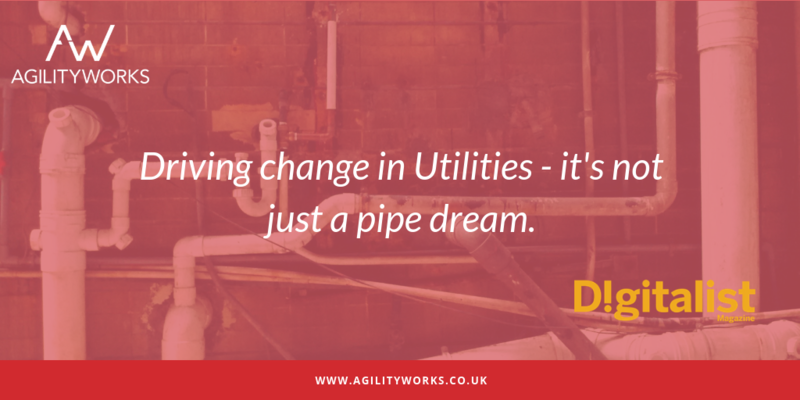 I’ve been lucky enough to work with some of the key utilities organisations here in the UK. Over the past three years, I’ve been involved in leading or assuring a number of high-profile enterprise-wide business transformations that have either led or placed significant focus on a business change element, with the backbone of these transformations being technology. Technology is by no means the single driver. I’ve been working hard to understand the established complex business models in energy, how these companies are changing (and moreover, what is driving this change), the disruptive new players who are entering the market, and the new technologies that are gradually reaching scalability, resilience, and greater adoption. “Change” is, in my mind, the new trendy business term. Akin to the days when every half-reputable service provider or software solution glorified the likes of “service-oriented architecture”, “change” and its seemingly intertwined twins, “innovation” and “transformation”, is the new panacea that everyone promises – yet often fails to deliver. I would like to think that wherever utilities organisations are on their journey, we have at the very least listened and sought to understand the causes for, and impacts of, such change and how technology may help aid these. Neill heads up the Energy and Natural Resources Sector at AgilityWorks, and is excited by how the latest innovations in technology can transform the vertical. He works closely with Practice Directors, Marketing and SAP to deliver industry solutions using SAP and demonstrable value through innovative engagement. How Can SAP S/4HANA Boost Your Enterprise Resource Planning? Life doesn't wait and neither should you. If you want to join a bunch of people intent on changing the world, you've come to the right place. ©AgilityWorks Ltd. All Rights Reserverd.